In 2013, I challenged myself on Goodreads to read 75 books for the year and read 176%. Fist bump. Yes! 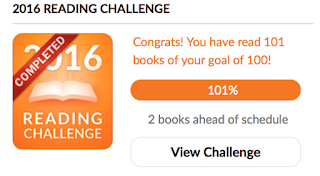 In 2014 I challenged myself to read 100 books and succeeded. Too easy. In 2016 I vowed this would never happen to me again! My challenge was to read 100 books and if that meant reading skinny books, picture books, comics, whatever, then that's what I would do. On December 30th, I went to Barnes & Noble to make an exchange for my kids and spent some time reading picture books to catch up. I don't feel bad about my reading choices; I love kids books and all those beautiful illustrations. In fact, I bought one at Klindt's Bookstore in The Dalles, Oregon over Christmas break (Number 1 on my list). I walked in, read it, bought it, took it home, and immediately read it two more times. The illustrations are fabulous! Lovesies! Ha ha! I did it!